They say time goes by a little more slowly on the East Coast. The people are calmer, the traffic less hectic, and nobody ever really seems to be in a rush to get anywhere. The stores aren’t open 24 hours a day, seven days a week – in fact, you’ll be lucky to buy a loaf of bread if it’s past 5 pm on a Sunday. It’s what some people might find inconvenient or old-fashioned, but real Maritimers know that there are far more important things to be doing on a Sunday night than scurrying around supermarkets or shopping for handbags. Things like piling wood into your basement for the coming winter, fixing a pot of tea for your family or taking a drive to see your grandparents. I always used to think that made the Maritimes boring. The fast-paced cities – the ones that rarely seemed to sleep – were exciting to me, a girl from a town so small it seemed to be in permanent doze mode. But I’m starting to re-evaluate my scathing regard of Maritime life. I’m learning to appreciate that maybe 110 per cent isn’t the be-all-end-all, that maybe firing on just one cylinder isn’t all that bad. This occurred to me recently while sitting on a two-hour flight back to Toronto, after a solid two-and-half weeks home on the East Coast. Being home took some adjusting. The very first night back in my old bed, I couldn’t get to sleep. I tried stacking all the pillows under my head, I alternated between laying on my side, my stomach and my back, and I even tried counting backwards from 50. Around 2 am, it finally hit me: the room was completely, utterly, disturbingly silent. There were no sirens, no traffic, no central air blowing through the vents. There was just my breathing and the occasional crackle from a stick of wood in the stove downstairs. Total silence. After months of constant white noise, my body couldn’t handle it anymore. The next day, I woke up to the sound of the kettle whistling downstairs – my dad preparing his morning tea. A very Maritime thing, tea is. City people would much rather guzzle their caffeine in more concentrated and therefore time-efficient forms, from paper cups labeled with Starbucks. The remainder of my day, and all the other days I was home for that matter, was spent puttering around the house and going for walks through farmers’ fields along the marsh. That’s another great thing about the East Coast – you can walk freely on another man’s property without a suspicious eye targeted your way or a patrol car sidling up beside you. I ate supper at an actual dinner table at a reasonable time of day, rather than my 8 pm routine of balancing a plate of supper on my knees as I distracted myself with television. I dialed it back a bit, took a few longer breaths, and actually tilted my head upward to see the stars. And, just once, I swear I actually heard snow fall. It was exhilarating. But rather than get too nostalgic, I’ve been doing my best to incorporate the things I liked best about being on the East Coast into my life here in the city. I’ve been forcing myself to leave work on time so that I can go home and eat supper at a reasonable hour – at the dinner table of all places. I smile at bus drivers and strangers whenever I can, I say “thank you” as often and as heartfelt as possible, and most of all, I’ve been drinking a heck of a lot of tea. Because it doesn’t really matter where I lay my head at night – in my heart, the East Coast will always be home. This recipe is adapted from one my dad clipped out of the local newspaper I used to work for. It’s an even sweeter twist on the classic sugar cookie, incorporating my favourite of all genuine East Coast ingredients, pure maple syrup. 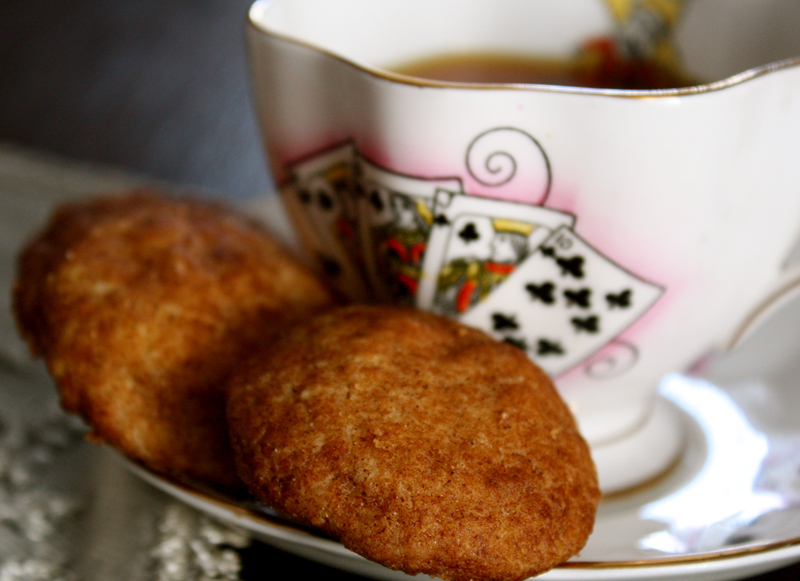 A dusting of warm cinnamon really does the trick to make them the perfect accompaniment to a steaming cup of black tea. Preheat oven to 300 degrees Fahrenheit. In a small bowl, combine 2 tbsp white sugar and cinnamon. Set aside. In a large bowl, whisk flour, baking soda, salt, brown sugar and remaining 1/2 cup white sugar. Cut in butter and stir in maple syrup. Form into small 1-inch balls and roll in cinnamon mixture to coat (If mixture won’t easily form into balls, drizzle in additional maple syrup and pack well with your hands). 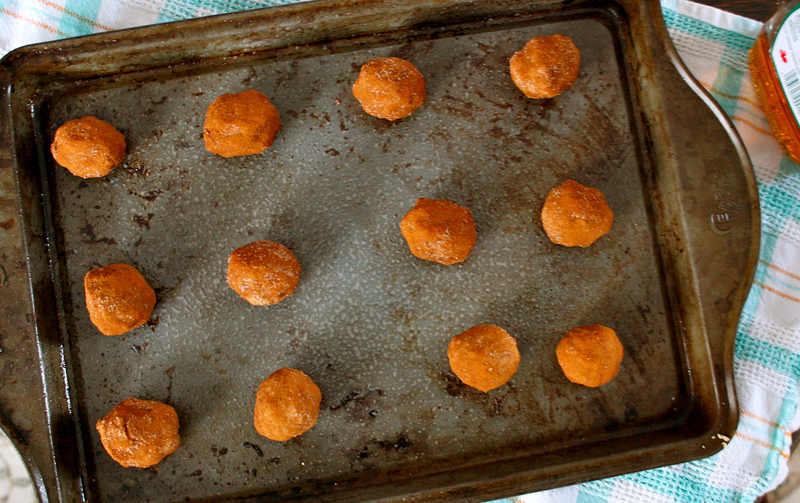 Place cookies on a large baking sheet, leaving 1 to 2 inches between each. Bake for 15 minutes, until bottoms are light golden and tops begin to lightly crack. Let cool on sheet for 2 to 3 minutes, then transfer cookies to a wire rack to cool.